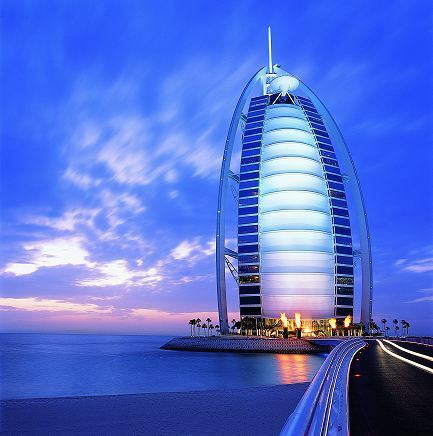 The Burj Al Arab is located in the Jumeirah Beach area of Dubai, 15 kilometers from the main city centre and 25 kilometers from Dubai International Airport. It opened in December 1999.it took 2 years to reclaim the land from the sea, and a little less than three years to construct building. The Burj al Arab rests on sand. Hundreds of cement piles that reach 130 feet under the seabed to anchor the foundations are held in place not by bedrock, but by friction. It is 321 meters high and 280 meter in the sea .the 2 side’s pieces are made of steel; the middle is made with concrete and inside it is fiber glass.